Hiring was 6.4% higher in December 2018 than in December 2017 and Forbes has recently named Dallas as one of the most competitive job markets. But where are these people coming from? 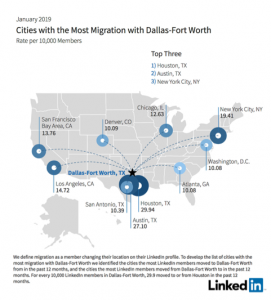 According to LinkedIn 2018 recap, the graph below indicates the cities with the most migration of workers to Dallas-Fort Worth. This resource is extremely valuable when looking for talent and how a recruiting firm might be able to help you branch out and find new and fresh talent.